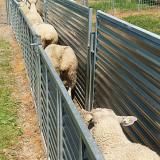 Solid sides (corrugated to provide strength without the weight of heavy gauge steel) block the animal's side vision and encourage sheep/goats to move forward on their own to the exit. For items that require motor freight (LTL/Truck), we will contact you via phone or email with a quote before the product is shipped. *Items #910810, #911800 and #911810 ship LTL/Truck. Use in handling systems. 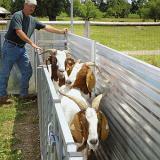 Use tall panels (45") if you have meat goats or sheep breeds that are tall or lively (e.g. Romanov). 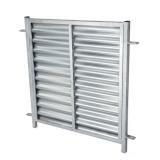 Strongest and most durable chute panels on the market. 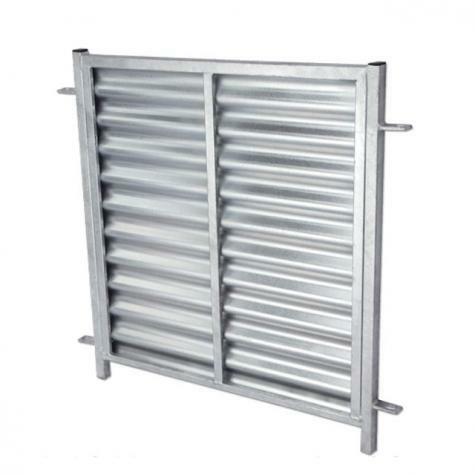 Square steel frame is hot-dip galvanized after manufacturing to double its life and provide years of rust-free appearance. I was in search of a 9 foot wide panel to cover the back of my car port. The 9 ft solid chute panel was the perfect solution. Getting ready to order my second one to complete my enclosure. Well packed. Arrived in perfect condition!